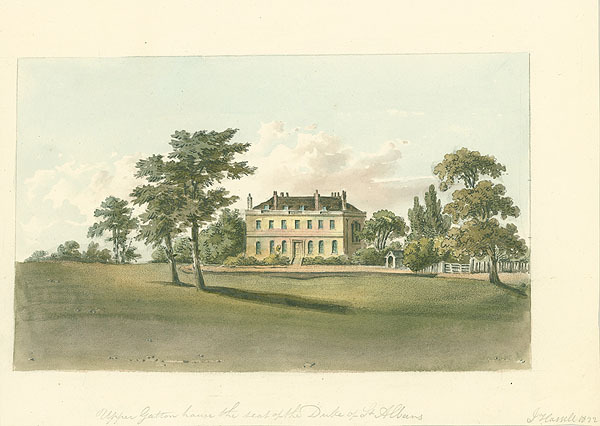 When Frederick enlisted in October 1915, he gave his address as 1 Castleview Villas, Eton Wick. He was 34, and working as a chauffeur. The army made good use of his driving skills and he became Private, M2/130622, a driver in the mechanical transport section of the Army Service Corps, part of 569 Company, a Motor Ambulance Company. His service records describe him as 5’7” tall, weighing just under 10 stones, with a chest measurement of 37½” fully expanded, 34” at rest. Frederick was buried in Datchet. 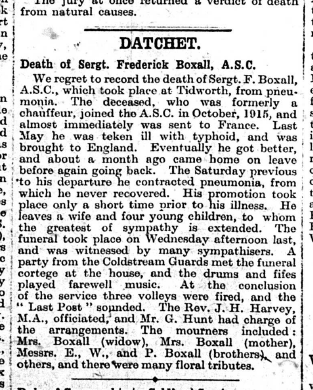 The Windsor & Eton Express reported on 10 March 1917: “We regret to record the death of Sergt F Boxall, ASC, which took place at Tidworth, from pneumonia. 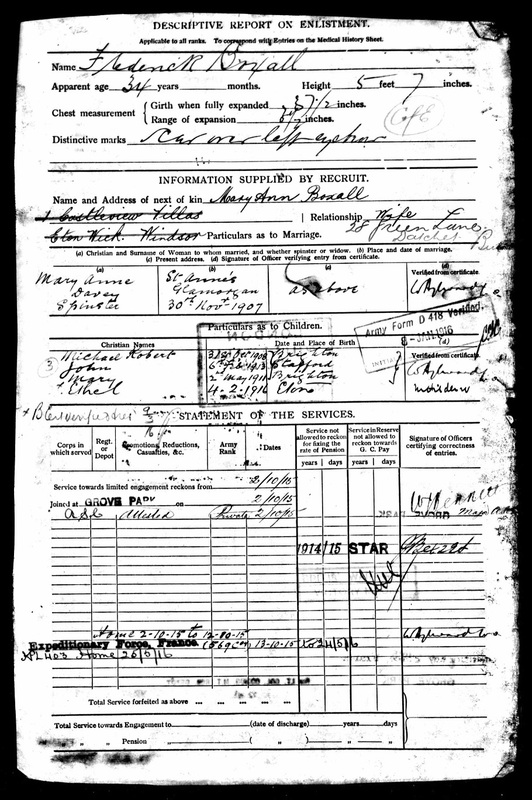 The deceased, who was formerly a chauffeur joined the ASC in October 1915, and almost immediately was sent to France. Last May  he was taken ill with typhoid and was brought to England. Eventually he got better and about a month ago came home on leave before again going back. The Saturday previous to his departure he contracted pneumonia, from which he never recovered. His promotion took place only a short time prior to his illness. He leaves a wife and four young children, to whom the greatest of sympathy is extended. The funeral took place on Wednesday afternoon last and was witnessed by many sympathisers. A party from the Coldstream Guards met the funeral cortege at the house, and the drums and fifes played farewell music. At the conclusion of the service three volleys were fired, and the ‘Last Post’ sounded. The Rev J H Harvey, M A officiated and Mr G Hunt had charge of the arrangements. 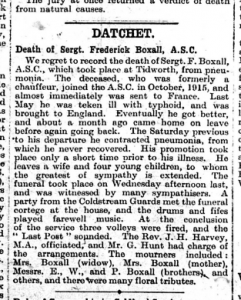 The mourners included: Mrs Boxall (widow), Mrs Boxall (mother), Messers E., W., and P [Ernest, William and Percy] Boxall, brothers, and others and there were many floral tributes. This is confirmed by the cemetery records which also indicated that he died ‘on H.M.S.’ but no military records for him have been found yet. It seems perhaps strange that Frederick had a military headstone but Jehu didn’t. The gravestone does not include any mention of Jehu John. 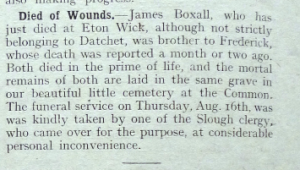 If Jehu John died of wounds sustained during the war, why doesn’t he have a CWGC headstone in the cemetery when his brother does? When and where was he wounded? Which regiment was he serving with? 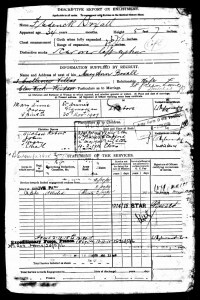 The only military records we’ve found so far are the Royal Hospital Chelsea Pensioner Soldier Service Records which refer to his earlier, pre-WWI service in the Scots Guards. The Commonwealth War Graves Commission has suggested that either John did not die in military service, or died after being discharged of an injury or illness unrelated to military service in WWI, or his death met the qualifying criteria for inclusion in the CWGC’s records as a war casualty but his details were not passed to the CWGC by the Service Authorities at the time. This gives the cause of death as a cerebral tumour that Jehu John Boxall had had for about 18 months. It seems he also suffered convulsions for five hours and was in a coma for two hours. His brother, Alfred Ernest Boxall was present at his death. 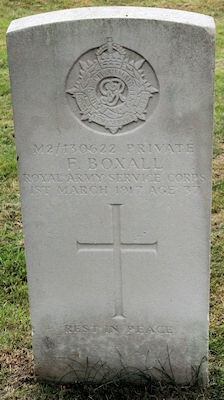 There is nothing that confirms he died of wounds received in WWI, although his family may well have believed that the brain tumour was a result of his military service. If anyone has any information which can help us solve this mystery, please do get in touch.